One of the disadvantages of small form factor motherboards is that they only feature two memory slots. 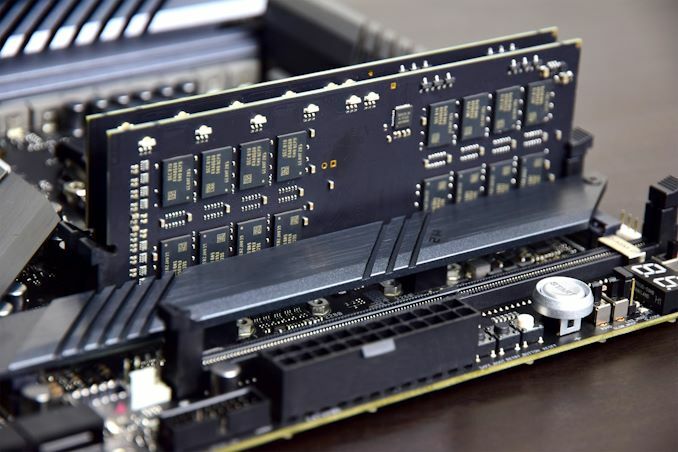 Most consumer DDR4 modules can have a maximum capacity of 16 GB per module, which for mini-ITX would mean a maximum capacity of 32 GB. For ATX motherboards, this usually means a maximum capacity of 64 GB. 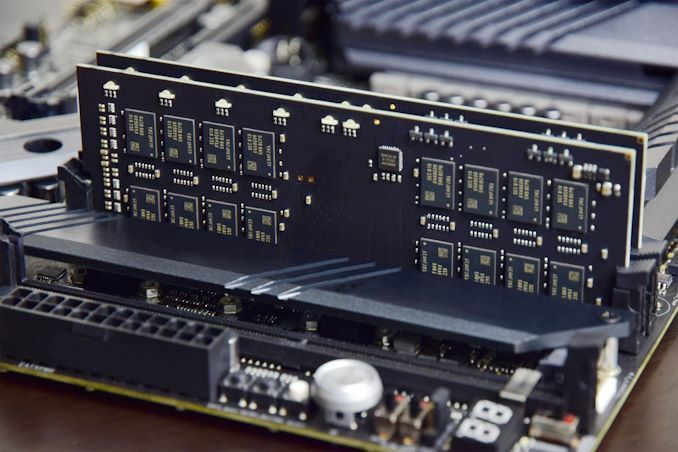 Users looking to build those small form factor systems have historically been capped to 32 GB - these new modules doubles that capacity to 64 GB. These are all Z390 chipset motherboards, and thus applies to Intel's 8th Gen and 9th Gen processors. In this review we used an i7-8700K, and it didn't have any issues. We tested on some other motherboards from MSI and ASRock, however those systems did not post. It would appear that the memory has been developed in conjuction with concurrent validation with ASUS. Each memory company is only offering a select number of kits, presumably due to the low catchment rate of the motherboards they are validated for, but also likely due to cost. All of these kits (except ZADAK's DDR4-2666) have a rated voltage of 1.35 V. G.Skill's kits do not have associated MSRPs due to the way G.Skill operates, however ZADAK has shared that their memory kits will start from an MSRP of $800. The benefit of dense(r) memory is thatmotherboards can double up on maximum capacity without needing four memory slots. 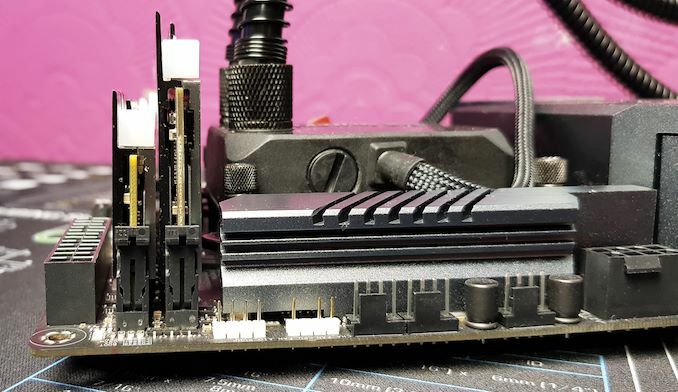 All three motherboards listed, the Apex, Gene, and the Z390-I Gaming, only have two memory slots which makes them ideal targets, even though only one is mini-ITX and the other two could have had four memory slots in place. The reason why only these ASUS motherboards are supported at this time is due to the collaboration between the companies: ZADAK says the modules were 'co-developed', but failed to go into detail about who designed what. Nonetheless, these modules are ASUS exclusive for the time being. Using memory that is double the height of a normal module, certain other restrictions come into play: namely the CPU cooler being used has less room to exist. The almost universal intention in this environment, unless a low powered CPU is used, is for a liquid cooler to be in play. We'll go into more detail on the specific kits over the page, but both memory modules work in a similar fashion. One would assume the signalling would be different, however within the same channel, a normal set of memory modules would use the same traces and either (a) daisy chain, or (b) split near the end in order to support both simulateously. There are stability advantages to the (b) method, known as T-Topology, however it is often more difficult to do. Either way, because two memory modules on the same channel do not need separate motherboard traces, that is what makes these modules possible. There are some additional fine tuning elements to the system as well, as with all memory. Ultimately any memory vendor's chips could have been used, but both G.Skill and ZADAK have gone with Samsung B-die, which are known for being good overclocking-focused memory. It likely also helps that the optimizations for one company's kit also helped with the second, as different ICs would have different requirements in the firmware. How is the power draw affected? The goal for both answers should be negative: we shouldn't expect any performance difference and no power difference. We also do some overclocking to see if they can be pushed harder even in this form factor. Our motherboard benchmarking suite which includes our short form CPU performance tests and gaming tests were selected in conjunction with our new 2019 bench suite. Our test bench OS has been updated with drivers, newer software and as with our CPU testing updates, also includes Spectre and Meltdown patches. Really interesting article, thanks Gav and Ian! 128 GB and 256 GB DIMMs use TSV (sometimes called 3DS or 3D stacked in the server business) memory. That's why they are more expensive.